Holy S#$t! 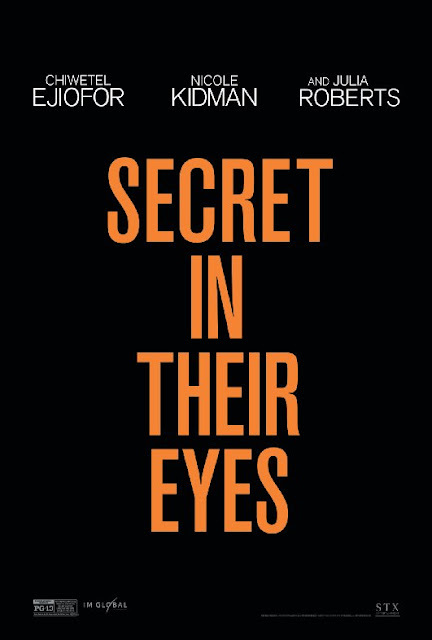 The first trailer for Secret in Their Eyes just gutted me. It's so powerful it has me wondering whether I could watch the film in theaters. For those of you that are parents out there, don't you find movies that harm kids are tough to watch? My hubs still refuses to watch Mystic River because he can't bear to feel Sean Penn's pain—and we don't even have a daughter! The thriller is a remake of the 2009 Best Foreign Language Film The Secret in Their Eyes and based on the Spanish-language book by Eduardo Sacheri. Writer/director Billy Ray switched things up for the English version of the movie: the film stars Chiwetel Ejiofor, Nicole Kidman and Julia Roberts as an FBI investigator and a mother whose 16 year old daughter is savagely murdered, a part originally played by a man. Ray (Best Adapted Screenplay nominee for Captain Phillips) apparently wrote the screenplay with Julia Roberts in mind. We typically think of mothers through a soft focus; on Mother's Day, mommies are feted with flowers and flowery cards singing praises to their sweet, eternally giving sacrificing side but inside every mother I have ever known is a real MOTHER, a woman who doesn't just whimper "Oh, I'd do anything for my child" she Means it. While little daily sacrifices, like that last helping at the supper table, are made by most mothers without a second thought, real MOTHERS will also sacrifice their lives for the life of their child without blinking. When pushed into a corner, when someone threatens or harms their babies, that's savage payback time. We go into attack mode. 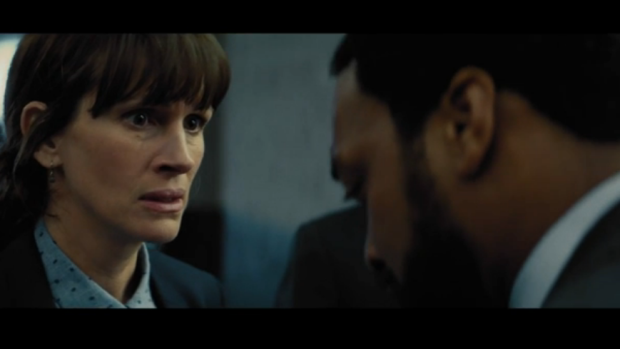 Judging from the trailer, Julia Roberts' inner mommy is coming out strong. Pity the fool who gets in her way. Secret in Their Eyes comes out October 23rd. Just in time for awards season and it looks like a contender. No kidding. On the minus side my son watched the trailer and while he loved the look of it, he thought the music was heavy-handed and melodramatic. Hard to say if that's part of the score or just something the marketing department put together for this first trailer, a case of the promo music department composer gone amok. Mark Jan Wlodarkiewicz takes the credit of 'music editor' on imdb as opposed to composer so it's hard to say.